Resilience is the foundation for healing trauma, both for individuals and communities. According to the American Psychiatric Association, resilience is the process of adapting in the face of adversity, trauma, tragedy, threats, or significant sources of stress—including disasters, racial tension, domestic and gun violence, abuse, and poverty, and witnessing domestic, community, or school violence. It means being able to "bounce back" from difficult experiences. Building resilience is at the core of social worker practice, and, therefore, embracing and promoting trauma-informed approaches is natural for social workers. When social workers think about trauma-informed approaches, they consider the impact of the Adverse Childhood Experiences Study (ACE Study), seminal research that forever changed the way professionals discuss trauma. The ACE Study, which came out of a partnership between the Centers for Disease Control and Prevention and Kaiser Permanente, assessed the relationship between adult health risk behaviors and childhood abuse and household dysfunction. From this research, we understand that the prevalence of trauma is high and that there is a correlation between adverse events and poor health outcomes. What can we do in the face of this reality? The answer is simple: promote resilience. In the bigger picture, resilience is the ability of communities to prevent adverse childhood experiences and mitigate their impact. Resilient communities withstand and recover from community stressors and learn from past stressors to strengthen future response and recovery efforts, the experts say. Community resilience remains central to the discussion and to the effectiveness of trauma-informed approaches. It's not based upon what's "wrong" with you, but what "happened to you" and how individuals survive and thrive in the face of adversity. • residents are engaged in the community and connected to each other. Resilience can be learned, taught, and built upon. The social worker remains an integral part of this dialogue when operating within the team and community structure. Social workers can also benefit from building their own resilience as they approach tasks with colleagues on their teams. When social workers develop their own effective self-care strategies, they're in an ideal position to influence peers and team members as those colleagues develop and nurture their own skills. Social workers can positively influence a culture in which everyone learns how to best take care of themselves—and others—in any situation. • cultural, historical, and gender issues. These principles are at the core of social work practice. Trauma-informed approaches are finding many applications and resulting in significant successes. The National Council for Behavioral Health is partnering with organizations and communities on this journey. For example, the Trenton Health Team in Trenton, NJ, convened a learning community in partnership with the National Council to successfully raise awareness and advance trauma-informed approaches across nearly 20 organizations. Social workers in Trenton played a critical role in training the workforce, revising screening and assessment processes, providing evidence-based trauma-specific practices, addressing secondary traumatic stress among staff, and improving organizational wellness. The process created a shared language that everyone understood. It also embraced the latest research and science around trauma-informed approaches. The work in Trenton continues far beyond this learning community and includes local universities, schools, and government agencies. In the Southern Kenai Peninsula of Alaska, practitioners of trauma-informed approaches are concurrently addressing poverty, child abuse, suicide, isolation, and other mental health concerns. They are working with schools, hospitals, and other organizations to strengthen their internal processes and connect viably as a community. The movement continued in Flint, MI, this past October. The Flint School District Trauma-Sensitive Schools Learning Community is advancing trauma-sensitive approaches to better serve this community impacted by racism, poverty, and a water crisis but rich with committed residents, including social workers, who believe in the power of individual and community resilience and hope. 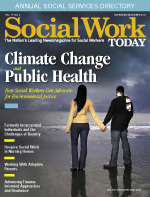 Social workers have been the frontrunners and early adopters of trauma-informed approaches. They do it through careful use of clinical practices such as eye movement desensitization and reprocessing, trauma-focused cognitive behavioral therapy, and dialectical behavior therapy. They do it as case managers and direct or nondirect service providers working at the state level, on the ground, and in between. Social workers are highly qualified to mitigate the impact of adverse events by infusing the principles of trauma-informed approaches into every interaction. They develop skilled approaches to create safe environments, embrace the voices of consumers and staff, promote transparency in all processes, and increase the quality of service and overall experience to realize outcomes they all seek: for clients to advance their recovery, embrace meaningful relationships, and increase opportunities for housing, education, and employment. At the macro level, social workers can ensure application of trauma-informed principles in advocacy, policy, and other arenas. Social workers understand the importance of parallel processes that state-level agencies need to embrace trauma-informed approaches so direct-level services can successfully advance this work. • Lack of understanding: People both within and outside the profession may believe this approach is only about clinical work. In fact, that's only one part of the broader framework. While social workers can be champions for the work, becoming trauma-informed involves everyone in an organization and community. • Advancing organizational cultural change: Colleagues may get overwhelmed with, "Where do we start?" Remind them that this work is a process, not a project or program. Organizational cultural change happens bit by bit; it is a marathon and not a sprint, and it can take years. The work requires the buy-in of leadership and management, so it is important for social workers to engage leaders in this work. Organization executives, mayors, superintendents, medical directors, police chiefs, and others must take charge and demonstrate the urgency for this transformational work. Social workers can support leaders as they take the lead in advancing this new way of behaving and doing business. The bottom line: Evidence is emerging across the country to establish and validate the "business case" for trauma-informed approaches with compelling evidence from early adopters. ACEs Connection recently highlighted the following successes. Following the adoption of a self-healing model, Cowlitz County, WA, reported births in teen mothers decreased 62%, youth suicide and suicide attempts fell 98%, and youth arrests for violent crime dropped 53%. Lincoln High School in Walla Walla, WA, reported an 85% reduction in suspensions, and Cherokee Point Elementary School eliminated suspensions completely. And in Lonoke County, AK, the Safe Babies Court Team Project found more than 99% of infants and toddlers served through the program were protected from further maltreatment. It's important to embrace a sense of urgency around the need to build resilience and foster hope, prevent adverse events, and increase community resilience when traumatic events occur. Without this focus and preparation, health care costs can increase beyond a community's reach. In fact, the ACE Study finds that adverse events are the number one health crisis in our country today. We ignore this fact at our peril. Becoming trauma informed begins with one person: you. This approach maximizes the opportunities that come from human connection. It allows social workers, at whatever level they practice, to take the best of what they know to make a real difference in the life of an individual, family, and community. — Karen Johnson, MSW, LCSW, is director of trauma-informed services at the National Council for Behavioral Health.